Almost all cards show one of 4 colours and many cards show one of the various special actions too (occurring when drawn, played or discarded). To move, you must play cards that match the colours of the next spaces along your path – 1 card for your next space, 2 cards for each space after that. This adds lots of fast card-management decisions to your game as you’re constantly trying to collect the mix of cards that will advance you and hinder your opponent. Many cards are both a colour and a type which adds some extra decisions to work out whether to use a card for its colour or its type (special effect). This is made slightly more tricky because you have a hand limit of 7 cards (and sometimes even fewer), plus the mix of cards you want changes rapidly as you and your opponent move. Some cards (horses for Scott, and dogs for Amundsen) count as any colour but only for the relevant player. You can take one to deny it from your opponent but it’s just a single colour to you. Playing a pair of Blizzard/Crevasse cards makes the opponent lose their way which moves them off of their route. The ‘lost’ player can not perform actions until they play cards to move back onto the route, plus they’re more susceptible to cards that move them further backwards. Other special cards steal a card from the opponent’s hand, advance spaces, force the opponent to lose all their dogs/horses (which are wild cards), etc. 1911 Amundsen vs Scott is a fast and light game that’s full of fun, small decisions and plenty of screwage as you try to hinder your opponent. Like many games, there’s a lot of satisfaction in hearing your opponent’s groan as you manage to de-rail their plan just before they were about to spring it. You need to keep assessing your plan the whole time, especially as a single new card can sometimes allow you to find a new way to use/combine your cards to deliver a better effect; however, you need to factor in that gaining that card may require discarding some other cards to get it. Quite often you can decide to gamble that your opponent won’t take a card you want so you can get it at a cheaper cost on your next turn. Also, you need to keep an eye on what your opponent is doing, or has drawn, too – if you know they already have a crevasse/blizzard card then you may want to stop them taking another. If their next space is red, is it worth denying them a red card, or do they already have one anyway? There is quite a great deal of luck in which cards are available to be drawn which can affect your progress. I thought this would be an issue for me as I’m not keen on luck playing too great a part in a game; however, things move quickly so it feels outweighed by the constant change of the cards and the light-hearted gameplay. You just need to react to situations rather than sit in hope awaiting the right card, especially as games are often close-run and a small delay can make a big difference. The game comes with 3 different expansions that can be used in any mixture. 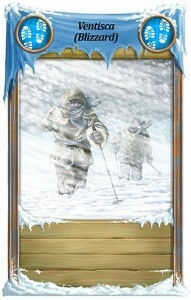 The first is a selection of patron cards which give players a minor special ability at the start. The second is an additional stage of gameplay that requires players to make their way back to the boats after they reach the pole. This is pretty neat as the first half of the board is flipped over to reveal a new section and there are a few extra rules. 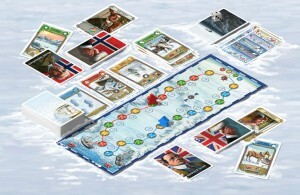 The third expansion is weather which are cards drawn each time a player crosses one of the parallels on the board and requires a dice to be rolled to see what effect the weather will have. 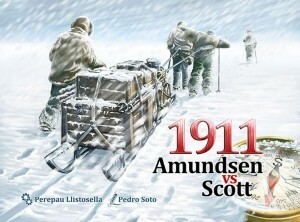 Overall, 1911 Amundsen vs Scott is fast, entertaining and a relatively short game which (for gamers) serves well as a light starter or finisher game. You’re always eager to see what the next cards are and how you can combine them to speed along your route. The ‘collecting colours to move’ gameplay is fairly abstract, but the theme (which I really like) has been combined well as much as is possible; for example, having your hand limit reduced to 5 cards because an ‘Equipment Loss’ card was played on you, or the Compass card helping you advance before you pass the 85th parallel but hindering you after that. Whilst luck plays quite a part, it’s acceptable in a light game and, at the end of my games, I have always found both my opponent and I (all experienced gamers) have wanted to play another game. This entry was posted on Wednesday, April 9th, 2014 at 4:04 pm	and is filed under 1911 Amundsen vs Scott, Board Game Review, Board Games, Essen Spiel 13, Spiel 2013. You can follow any responses to this entry through the RSS 2.0 feed. You can leave a response, or trackback from your own site.